Bronx, NY -- On March 8, 2012, the New Settlement Parent Action Committee gathered 100 parents, students, educators, and elected officials on the steps of the Bronx Borough President's office to express their outrage over the Bronx's shocking rates of school-based arrests and student summonses, and to demand positive disciplinary alternatives. Recent data released under the Student Safety Act -- new legislation that disaggregates statistics on arrests and summonses by race, age, and gender -- shows the disproportionate impact that harsh punitive measures in New York City schools have had on the Bronx, particularly on youth of color. Out of a whopping 532 summonses issued to New York City students to appear in court during the last three months of 2011, the Bronx alone accounted for nearly half of all cases. 63% of those summonses were for charges of "disorderly conduct." Unbelievably, 93.5% of the nearly 300 students arrested in the same time period were either Black or Latino - and here too, the Bronx topped the list as the borough with the highest percentage of school-based arrests. The press conference began with Frank Rivers, an 18-year old Bronx student, and member of Sistas and Brothas United. "We know low-income students of color are being criminalized by being suspended and arrested in our classrooms. Discipline should be handled by school staff, not NYPD cops." Andy Artz, attorney at Legal Services NYC-Bronx echoed similar concerns: "Many of the young people I've represented in long-term suspension cases were also arrested in school. These are not just older teenagers getting arrested; many of my seventh and eighth grade clients have been arrested for things like fighting in school, or for resisting when a School Safety officer attempted to take them to the office. Some of these students are in special education, and struggle to respond appropriately to authorities. We need to change the policy that permits so many children to be arrested in our schools. Instead of suspensions and arrests, our schools should be using positive alternatives, such as restorative practices, which foster a culture of safety, respect, and dignity." The data collected under the Student Safety Act validates community concerns about excessive policing towards historically marginalized communities. Since the NYPD was awarded control over school safety in 1998, serious questions have been raised regarding the abilities of NYPD School Safety Agents to distinguish minor school disciplinary issues from criminal behavior that warrants an arrest. Local elected officials also expressed their anger around the policing of Bronx students at yesterday's press conference. "One -- that is the days of training that School Safety Agents get by the Department of Education before they are put into our schools to 'police' our children. One day. That is not acceptable. School safety agents should be there to protect the students. They should not be there to make them feel like they are in prison...we should not be policing our children; we should be teaching them," remarked State Senator Gustavo Rivera. Esperanza Vazquez, a parent leader with the New Settlement Parent Action Committee, considered the impact of arrests upon Bronx youth: "More than 93% of the students who were targeted for arrests were African American and Latino. These statistics demonstrate that the current school system criminalizes, and is not welcoming to, youth of color. What does it mean to have an arrest on your record at a young age? For a young person, having a record can affect the rest of his or her life. One arrest can deny you access to a higher education, to future employment and to many other opportunities that most of us take for granted. Suspensions too, are pushing our youth out of schools and into the streets, into the criminal justice system, into low-wage jobs, therefore continuing the cycle of poverty." State Assemblywoman Vanessa Gibson called for the Department of Education to implement positive disciplinary alternatives. "It seems as if these growing statistics are more of an extension of our criminal justice system, with textbooks being replaced with handcuffs. These growing numbers and these statistics which are being used to define our young people, are shameful at best... We are asking the Department of Education to come to the table and implement alternative measures that keep our young people engaged. Instead of sending them to the local precinct, implement counseling, and more guidance counselors and social workers in our schools. Throwing our young people in jail is not the answer. That does not solve the problem and that does not address many of the challenges that we face ... we are demanding a greater accountability from the Department of Education." 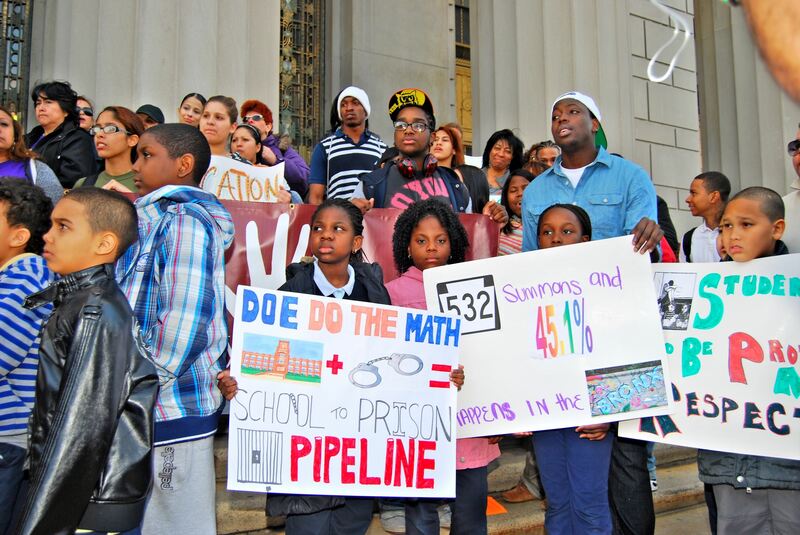 Participants gathered at the press conference, most of whom are affiliated with the Dignity in Schools Campaign-New York, are calling for the use of positive alternatives to discipline for minor incidents that are currently resulting in the use of arrests, suspensions, and summonses, through the use of restorative justice approaches or positive behavior intervention supports (PBIS). They are demanding that more city resources be put towards implementing positive alternatives to discipline in New York public schools. Additionally, the coalition is calling on elected officials to hold an oversight hearing to demand greater accountability and transparency on how school arrests are being made and why they are disproportionately affecting Black and Latino youth. The Dignity in Schools Campaign-New York is a coalition of students, parents, educators, civil rights, students' rights and community organizations, including: Advocates for Children of New York, Center for Community Alternatives, Children's Defense Fund-New York, Coalition for Asian American Children and Families, Coalition for Gender Equity in Schools, Desis Rising Up and Moving (DRUM), Future of Tomorrow, Make the Road New York, Mass Transit Street Theater, National Economic and Social Rights Initiative (NESRI), New Settlement Apartments Parent Action Committee, New York Civil Liberties Union (NYCLU), Pumphouse Projects, Sistas and Brothas United, Teachers Unite, The Sikh Coalition, Urban Youth Collaborative (UYC), Youth Ministries for Peace and Justice, Youth on the Move, and Youth Represent. Dinu Ahmed is a community organizer at the New Settlement Parent Action Committee.